Ovals are here to stay! 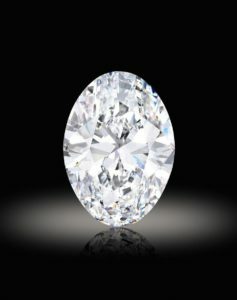 A flawless 88.22-carat diamond fetched more than $13.7 million at the Hong Kong Sale of Magnificent Jewels and Jadeite held Tuesday. The total, which includes commissions and fees, surpassed the high estimate by over $1 million. The D color oval brilliant gem was the top lot in the sale of 2oo items, that featured a variety of diamonds, fancy colored diamonds, statement gems, and signed jewels. A Japanese private collector purchased the stone and named it the “Manami Star,” after his eldest daughter.